Sorry to take so long between updates, just consider no news is good news. Tatum had her third round of gamma and her body responded just fine. It's infused in about 3 hours and we're out of there. We have the ok to have a nurse come to our home to administer the gamma, but we're not sure we want to do that. We are not guaranteed a pediatric nurse and we have found a system that works for us at the hospital. Tatum's eyes are better, also. We switched her to a topical steroid and it seems to work. Please pray for our next door neighbor, Linda. Her husband and our donut fairy died yesterday. It was sudden and is shocking to us all. His health was worse than we all thought and after being admitted to the hospital last Thursday, he passed. We are so sad and Tatum and Hannah lost a friend and adopted grandpa. He was our donut fairy who visited every Sunday and left our favorites hanging in a bag on our back door. He did this EVERY Sunday since Tatum got out of the hospital. He was a loving spirit who did fundraising for Children's hospital after Tatum got sick. He checked up on us daily and was the epitomy of what a good neighbor should be. We loved Bill and will miss him so much. David is working on a new website for updating Tatum's health and our family. It has many pictures and will be much more current. I'll post a link as soon as it's up and running in the next day or two. Thanks so much for all who care about our well being. We saw Tatum's GI doctor yesterday. We had not seen Dr. Mittal since July, which was weird and the longest she has gone without a checkup. Things are looking great and he took Tatum off her steroid! Tatum is thrilled, as it messed with her stomach. We are hopeful her body will respond well. Her body now will make its own, hopefully without affecting the liver. Her liver function numbers have been rock-solid since April and we are prayerful that will continue, too! Her next checkup is in 6 months; assuming labs continue to go well. She'll continue labs once a month, assuming her numbers are good. We met two kids yesterday at the clinic; one had his liver transplant 11 years ago and the other 15 years ago. It is so wonderful and reassuring to see that. They were only there for their annual checkups. That's what we're working up to. I don't know that I'll ever consider Tatum "out of the woods", but she can finally see the forest in spite of the trees. (There's your cliché for the day). Tatum's next gamma infusion is Monday, Nov. 6 and we meet with the ophthalmologist again Nov. 3. We'll decide what action, if any to take with her eyes. Thank you always for your continued support and love. She will continue getting IVIG (gamma) until the spring most likely and in the mean time, we'll continue to be overly cautious and she'll wear a mask to school and to church. With flu season knocking at the door, Tatum needs to be more careful than ever. She will get a flu shot. In fact, the whole family will. Children's always gives transplant patients their shots first, but they got a grant to give entire families of transplant recipients a shot, too. Please keep Tatum in your prayers for protection against the flu. Thank you all for your comments and for continuing to carry us through all this. Life is good. 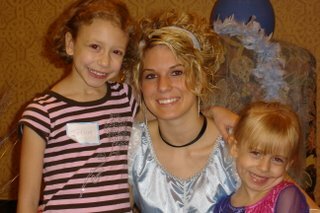 Make-A-Wish invited Tatum and family to have breakfast with Cinderella at the Stonebriar Westin Saturday AM. The girls had a ball (pun intended) and walked away with lots of goodies and made new friends. 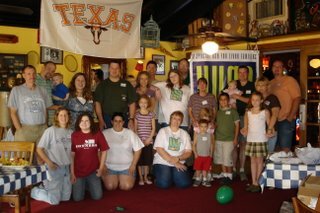 It really amazes me how large and quickly our transplant community is growing. It is truly a blessing to be a part of the Make-A-Wish family as well. Ever since Tatum's wish was granted, they have involved us with all sorts of events. Tatum got to speak in front of a couple hundred golfers last monday. Service King raises money for MAW with a golf tournamnet and Tatum got to tell how MAW made her dream come true. Several grown men were tearing up and apparently more money was given after she spoke. I am so proud of Tatum. After dining with Cindrella, we came back to reality and met up with 'Liver Families'. This is an international organization supporting families with children who have had liver transplants, or who are listed to have a transplant. We met at Fuddruckers in Irving and had a great time. It's always nice to compare notes with other families and watch these kids thrive. Tatum had her second gamma-globulin treatment this past thursday and all went well. She will have lab work done this thursday to check her kidney functions and make sure she is ok in that department. Like i've mentioned before, gamma is a protein and hard on the kidneys. Her immunologist has seen one of her patients go into kidney failure, but recovered before needing transplant. We're staying directly on top of it before it gets that far, and basically pouring water down Tatum's throat to keep her well hydrated! She did great getting her iv; her anxiety level is certainly not anything like it was 19 months ago. Can't believe it's been 19 months since her transplant. Please keep our donor family in your prayers and thank you for keeping Tatum there as well. I'll update after results from labs come in; probably thursday evening. Tatum goes for round #2 gamma-globulin treatment tomorrow at 9:30 in the morning. Hopefully, it will go even quicker since her body responded so well the first time. She is naturally nervous about getting an iv, but she has certainly come a long way! We have an actual name for her eye condition, finally. It's chalazion. Basically multiple styes and a plastic surgeon will remove them sometime in January. That's the first they could fit her in. Tatum's transplant doc is trying to expedite the procedure as she is at risk for infection. She is not nervous about that one yet. I'm sure she will be more as it approaches, but she said, "oh i've had much more serious surgery...i can handle that!" Little miss positive. Thank you for your prayers and thoughts. We are grateful everyday. Tatum's labs from Thursday shows her kidneys are doing well and her liver numbers are great! As far as the transplant team is concerned, she can remain doing labs every 4 weeks! That's a record so far. In the past 18 months she has done labs every other day, every week, every two weeks and now she can go once every four weeks. Don't think for a second she takes that for granted, either. She will have her next gamma treatment October 5 and they'll just draw labs from her iv so she'll only have to get stuck once. We're grateful for the small stuff. Her eyes are having difficulty healing from all the infected hair follicles so we'll see the ophthamologist in a couple weeks. Her attitude is still great, most of the time. Tatum had her first round of gamma globulin Thursday and all was relatively smooth. Getting and removing an iv is always the number one source of her anxiety, so we went well prepared. She has her method down and the nurses were good to follow her orders. This was probably the smoothest one yet. The gamma will give Tatum some much needed antibodies for fighting germs and she'll have this treatment every four weeks until the spring. Her body responded so well (blood pressure good and all) and she thought this was the easiest procedure yet. I cannot say enough wonderful things about the Immunology team and the nurses who do special procedures. We thank God everyday for those up at Children's. Tatum's eyes are better, as well. They are taking quite a long time to heal, but they are indeed healing. 17 people die every day waiting for organ transplants. There are only 7,000 viable donors/year. I urge you all to talk to your loved ones about donating your organs when you die. One person can save or make a better life for up to 50 people! That's too great to ignore. There is a growing community of wonderful transplant recipients and donor families and we are blessed to be a part of it. Thank you all so much for your continued support and love. 12th Annual Texas Rangers Organ Donor Game!